Hello, Life. Meet your new favorite traveler. | Welcome abroad. Please keep all hands inside the vehicle at all times. Hello, Life. Meet your new favorite traveler. Welcome abroad. Please keep all hands inside the vehicle at all times. Mendelssohn was born in Hamburg, and made his debut at age nine in Berlin and eventually founded the Leipzig Conservatory of Music. He was a conductor and pianist as well as a composer. Walking through his house was sort of like a dream. Of course the entire thing wasn’t his and was part of the museum, but the highlights of this house were found in both parts: his house and the museum. We were given listening guides which you were supposed to run along the number placed on the wall, then the device would start translating the German for you. Most of my time was spent smiling at all the facts I remembered from my Music History class this past year, and the rest was spent in this tiny, magical room where I virtually conducted a choir. It took us a minute to figure out that there was a little imaginary sphere you had to stay in for the machine not to stop playing the music. I probably spent close to an hour just in that one room. Shortly thereafter, the woman from the front desk came up and got onto us for playing the piano…that we had been on for probably 45 minutes before she came up and told us to stop. Ha! We had had our fill, and soon left the house greeting the annoyed woman as we walked out the door. Bach’s house was like a room full of things I wish I could touch–maybe I did, maybe I didn’t…–and there was an overload of information. We didn’t spend nearly as long there as we did in Mendelssohn’s house, but every room was really cool. The first couple of rooms were interactive, even though I didn’t go in order. The listening room was probably my favorite because I listened to all of Bach’s motet…in his house…that we performed…in front of his grave. It was beautiful, and though there were slight differences, I was pretty pumped that we got to perform it just the day before in front of Bach’s grave at his church. The experiences I’ve had here have been unforgettable. I promise to write more next time, but I have an early flight. Did I mention I’m not going home? Wednesday night we arrived at our hostel in this busy, busy town. I’ve seen this place in my textbook and I can’t believe I’m here! We’ll spend the rest of Singers tour here and it’s just now setting in that I’m going to have to say goodbye to these folks. Last night was more exploring the safe side of town (always!) and finding something to eat. We ended up eating at a place called San Remo’s. I order Tomato Soup and it was the best tomato soup I have ever had! The service was fast, and I was getting “hangry”by the time we got there (hungry/angry for those who are wondering). Next to the San Remo’s was one of the churches we were to perform in a couple of days, Nikolakirche. It was almost hidden behind the construction taking place next to the building, but it was a treasure to behold. Most of the first night we just roamed around and took in the last city we were going to see all together. The next stop was to get gelato! The particular place we went, called Weiss, had an overwhelming amount of flavors. I asked to try a simple one before seeing that they had a “Bach” flavor. After all, we were right next to where he was buried in Thomaskirche. The town of Leipzig is a mix of new and old. Across from Thomaskirche is Bach’s house, and my word was everything so beautiful. I didn’t actually get to go into Bach’s house until Saturday, but that’s a different story I think would be appropriate right here…..
As we were gathered around some tables just outside Weiss, conversation became focused on one topic: Berlin. It’s been my dream since I learned about World War II in the sixth grade to visit as many concentration camps, memorials, museums as possible before I die. It was aforementioned my love for history, and I was ecstatic to find that other people in my friend group shared the same passion for it. The question then became about getting there, the cost, and of course getting permission from our conductor and the only adult traveling with us. A train ticket proved to be too expensive we found out, but with all the buzz about going to tour Berlin, I don’t think we could let it go. One of my friends began communicating with one of the workers a our hostel to find a better way–the best way. She looked up bus ticket prices for us and after a some hours of figuring everything out (Only about $15 a person for the whole trip!) and deciding to buy them all at once, we were set to leave the next morning to catch the bus and take the 2 hour ride into Berlin. Excited isn’t even the word! At 8 the next morning I ventured down to breakfast and caught up with part of the group that was going. We had gotten permission and guidelines to follow from our conductor and had a little chat about being careful, etcetera–all the things we needed to know and do before leaving the big group to go off by ourselves. We had everything planned out and the bus was to pick us up at 9. Even though we were right across the street from the bus stop we left at 8:30 anyway just to be safe. I’m getting butterflies in my stomach now just thinking about how excited I was to get on a bus and have an adventure in BERLIN. Ahh! We walked right across the street to what we thought was our bus and waited….and waited…and waited. No one came and eventually someone from the group went inside the train station to ask if we might be in the wrong spot…..
After finding out we were a crosswalk or two away from our bus stop we began running with backpacks and all. I had on sandals and I was grabbing (or dragging?) my friend, Lindsey, along by the hand. People stared, gawked even, but at this point I was used to it because we couldn’t hide the fact that we were American. Right as we were about to cross the last set of train tracks, the light turned green and traffic rushed on keeping just a short distance between us and our bus. If it hadn’t had bene for one of my friends protecting the rest of us on the platform, I probably would have tried to jump through traffic (kidding….sort of). I was convinced nothing was going to stop me from getting to Berlin and going to Sachsenhausen and seeing what’s left of the Berlin wall..NOTHING…. Except when traffic cleared and our bus pulled away right in front of us. The walk back to the hotel was a dreary one; an angry one; a defeated one. I can’t begin to convey my disappointment. I wanted to try again, but the consensus among the group was to just head back to the hotel, avoid the quizzical glares from other members of our choir, and try not to think about the dreaded question(s) we’d have to face in the midst of our embarrassing defeat. “We don’t wanna talk about it.” Became my motto for the morning. Though we didn’t get to go to Berlin, I was determined to still have a nice day in Leipzig; I was determined to distract myself. So, we went shopping. I’ve heard that using shopping as therapy is a bad idea….but I’m not so sure anymore. I stocked up on mostly all the souvenirs I needed, and bought lots of things on sale from a store I’d never seen before. But when a dress is only 5 Euros…it’s only 5 Euros and I couldn’t say no. Most of the rest of the day was about finding food, trying on more clothes, and gearing up for a night out on the town. Dinner was always fun because there was one street in particular that was always alive, but it was especially alive when football was on. So we always dined around this environment that aided in cheering up my sad heart that still does long for Berlin. Oh, well. I guess that means I will have to return someday. I assure you, the adventure will not be lost on this traveler. Do you ever look around and forget you’re not in America? That you haven’t been in a long while and you think, “I could do this. I could be far from home.” And for a split second you forget about the people who would miss you and the friends you might lose contact with, and maybe even finishing your degree just to take in all the experiences with your friends and people you’ve never met before. Today I had that moment sitting in a pizza place with some friends for lunch. “I just feel far away, but I don’t feel like I’m in Germany.” One said. “I feel you.” I replied nodding my head in agreement. Our check came and it was not conveniently split up into different checks for the seven people in our group. I looked into my wallet to dig out what my share of the check was, and realized I didn’t have much there to give (thankfully I split a pizza with someone else). In the reality of needing to go to the ATM for the umpteenth time, and not understanding our waiter with the beautiful eyes, this post goes out to all the people I missed in that moment. I haven’t been gone long, and I won’t be gone for much longer, but the journey home is so long and sometimes you miss the comfort of knowing exactly what you’re ordering because it’s on an English menu. Today I was thankful for everything that reminded me of home. We went shopping down some street and found two H&M stores both with more than one level, and I was comforted by the fact that on any summer day I would do the same thing (shop with friends) in Alabama or Mississippi. My friend was right: today doesn’t feel like we’re in Germany, and by that I am comforted. On a day when we were having free time in Salzburg a man next to us ordered something that looked delightful. “Was ist das?” (What is that?) I asked him, pointing to his dessert plate. “Apfel Strudel! (Apple Strudel) Is very good.” He replied jovially. Cologne has a lot of history behind it. 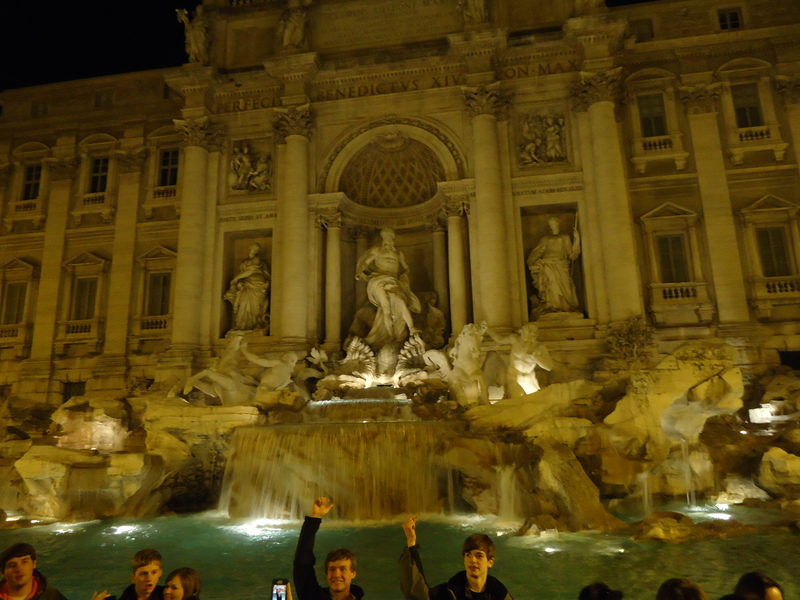 There was a lot of talk about Ancient Rome amongst my group who took a tour around the city. The Roman Empire was a vast expansion of land that extended across the Danube (which I saw yesterday, no big deal 😳) in what used to be part of “Gaul” (now modern day Germany). Because of this, I’ve gotten to see some random artifacts here and there, and also be in places that were once part of the Roman Empire. When I tell you my favorite subject I ever learned was sitting in Mrs. McGuffey’s ninth grade history class on Ancient Roman Civilizations, believe me it was.We saw an original Roman mosaic floor in a museum not far from the cathedral in Cologne and my jaw dropped. I just adore history, so my heart was so delighted to see it all around me. After the guided tour through the windy town, we ventured towards the Lindt chocolate museum where all our dreams came true (not joking). There was the history behind it and how it came to be the phenomenon that it is today which was pretty cool, but mostly I just wanted to try the chocolate. If we had gone through the whole museum without trying it I would have been sorely disappointed! Fortunately, as we descended some stairs we were able to see the factory where it was made and wrapped carefully in the signature paper we all recognize as chocolate. Just around the corner there was a figure that had golden lives it looked like and around them was a moat of chocolate. The woman tending to it had the plain-flavored wafers in her hand to dip in the chocolate and hand out. I assure you I made my rounds with that chocolate fountain. There were other places where you could make your own chocolate, but I decided to forgo that option to get another wafer (hehe). The chocolate museum was definitely a highlight for the day, and then we were on our own for the rest of the day! It was such a joy to be able to explore and see what we wanted to see and eat when we wanted eat–I know that sounds like little thing, but it was honestly so much more relaxing than if we had to take our big group of singers everywhere we went. I stayed close with my small clique of friends and in it flowed through various people, which made it fun. Everyone was kind of all over the place and saw everything and anything we really wanted to see. Cologne is a nice place, full of beautiful sights and coffee you can by for one Euro from a vending machine. I’ve enjoyed this day very much. Tomorrow we are off to Leipzig! Let it be known that on this day I lived like a queen. I took a cruise down the Rhine River with my closest friends, visited the house of Beethoven, and I returned home to my castle on the hill to sleep (the hotel). Next to the castle there was a park–but more on that later. 🙂 As anyone would expect, when we pulled up to this castle of a hotel gasps were heard throughout the bus. It had an old chapel inside it and we all decided to meet around 9:30 PM to try and record some songs (completely informal, of course). Everywhere in the building had a beautiful view and there was probably so much more to explore than I actually got to. Most o fee and my friends did our exploring down the ending roads of the town and through the open fields. We found a place to sit and talk and look at the sights around us. It was a little cold, but most of us didn’t mind. Everything in town was pretty much closed up since it was so late, but we enjoyed jus hanging out and consuming our gifts from the monastery where we performed earlier that day (lots of yummy bread. (: ). I love moments when I can just sit and take in where I am. Sometimes I experience Deja vu. A friend of mine once told me that he likes to think experiencing Deja vu means you’re in exactly the right place at the right time. It’s a comforting thought, even if it isn’t true and I found myself having the feeling a lot in Europe, actually so maybe his words do hold some truth. We walked back to the hotel from there, but stopped along the way to catch more of the town at night. It was a cute and quaint town. In my own mind I referred to it as a “Snow White” town because of the architecture, and maybe because I could see a princess and seven dwarves residing there. My friends and I were struggling to keep quiet on the way back for fear of disturbing anyone nearby, and despite the fact that we probably should have just gone inside the hotel…the park beckoned me. I knew I couldn’t stifle the laughter and the screams that were and at the park; it was too much fun. May the videos taken, the fast slide rides, and the insane swing ride we got to have never ver die from my memory. This will go down as one of my favorite nights, and favorite places to stay. The next morning we were set to leave at 8:30 Am to catch our boat to Boppard Village and eventually get to see Beethoven’s House. I remember waking up at 7:45 and one of my roommates got in the shower….the next time I woke up it was almost 8:20 and we had nothing packed, nothing picked out to wear, and things strewn EVERYWHERE across the room. I’ve never picked an outfit so fast before, or packed my suitcase. Well–perhaps you can’t call what I did packing. It was more like tossing everything into my suitcase and backpack and literally running out the door. I was exhausted, but I regretted absolutely nothing. We pulled up to this sweet little place next to the Rhine where I captured some lovely things. Everywhere in Johannisburg looked straight out of a story book. The vines on the brick walls, the freshly dewed roses, the locks on the fences by the water–everything. I couldn’t get enough of it, but was glad when our boat arrived and I got to get on. We ate on the boat and I had a nice cappuccino. We were to spend about four (?) hours on the cruise and most of my time was spent above the main level. Outside were all the views–the castles, the winding river in front of us, the landscape. I couldn’t capture everything with my camera, but I sure as heck tried. There was a list of castles in a little book that we were following. I went down a few times to let my body feel some warmth as opposed to the biting wind that nipped my nose and cheeks. In the hurry of the morning, I had forgotten to leave my cardigan out to wear, so a friend lent me his vest and I was very appreciative of it. The pictures and the videos I captured on the boat are by far my favorite of the trip, maybe besides Passau. When we got off the boat we found a place to eat in a hotel, and it ended up taking up all of our time there. We then met the bus and walked to Beethoven’s House in Bonn. Pictures weren’t allowed, and our guided tour felt very rushed, but being in a dead composer’s house will never not be interesting to me. All in all, this day was so good I don’t think there will be one to beat it…maybe come close. Then again…I do say that about every day that I’m in Europe. Staying in Linz has been interesting. Everything is spread out as if I was in the states again. I was expecting to find more things that reminded me of home, but I kept running into this language called German that kept putting a barrier between me and other people. We went exploring in the rain for the one night we got there (after I wrote the last blog post). One of my friends saw me without my rain jacket and traded me his rain jacket for my cardigan. Lol! Needless to say, much laughter ensued as he got soaking wet and I stayed warm and dry. My friends are great. Early on into the walk away from our hotel, we stumbled upon a Subway and walked past some sketchy bars just to head back to the hotel. All in all it was a good night, though. There has been so much laughter on the trip and so much singing. I am so thankful to be here with the MC Singers–it is unreal how much I enjoy these people! Don’t get me wrong, sure there have been times when we are all so frustrated, but those times could not outweigh the fun, and even emotional experiences we have already encountered in the short time. Linz is just a midway between where we were in Salzburg and where we are going to Neukirchen. Neukirchen is the cutest town I’ve seen by far! It’s in the mountains and there are these landscapes that I just stared at completely open-mouthed. We ate lunch as a typical Austrian place and I tried Weiner Schnitzel. The best way I could describe my first experience of Weiner Schnitzel is to tell you that it looked and tasted like a giant McDonald’s chicken nugget (At least I knew it was real meat). It came with delicious potatoes, as well. “No, no, Fanta! FAN-TUH!” He replied with laughter that soon made its way around my entire table of friends and my face became hot. We had a tour guide, Tomi, who told us all kinds of historical facts. We went Tomi’s house for coffee and cake and it was adorable! His house is everything I could have ever dreamed of. It was quaint and it had a library upstairs with an open space in the living room where we all sat and mingled. After we had our snack, we went to dinner in town. The workers and their families asked us to sing, so we sang “The Gift to Be Simple” and they loved it. It really is cool to be with a group of people that can cause so much joy in places like a restaurant or a hotel lobby. We are so far from home, but I feel like we are so at home. After eating way too much, we got to sing in this beautiful little chapel and the audience received us so well. We came back for TWO encores and took a picture which I’m sure has made its way around Facebook by now. Tomorrow, we go to Johannisburg/Bonn. I am so excited! I and the rest of the MC Singers arrived in Munich, Germany at around nine-ish “here time” (US is seven hours behind) May 11th, 2016. The first thing we did was get on a bus and drive for about two and a half hours to Salzburg, Austria. I remember being exhausted as I filled up a bottle of water with Emergen-C (I refuse to catch anything from anyone), and the next thing I knew I was stretched out on the long back row of the tour bus (five whole seats to myself!). When I woke up we were still on the highway, but on either side of us were the beautiful mountains. The view was never-ending. I remembered seeing the view from the airplane window, and I had to keep reminding myself (and my friends) that we had actually made it to Europe! The first day we should have slept. For experience’s sake we decided to forgo sleeping, because sleeping is for losers. ; ) We checked into our hotel and began our journey to the fortress (Festung Hohensalzburg). We began our trek with lots of stairs and steep inclines. I was in the perfect outfit for it, of course with tight jeans and flats. It wasn’t until we reached the gate to the entrance that I realized we could have taken the tram up into the fortress, and then there was the matter of our tickets. So, one of our choir members who speaks fluent German walked back down the mountain and back up so we could get in the gate. all in all it was a fun and tiring day! We ended the night laughing. This morning we woke up and loaded the bus before having our own days out on the town. Several wanton the Sound of Music tour, others to Mozart’s house. I chose to go to Mozart’s house because I was having a little trouble getting the ATM to take my card (Oh no! But one message back home and we go it fixed! ), and then I sat down to buy a ticket for the Sound of Music tour, but both times for the day were sold out. However, Mozart’s birthplace, and his actual house were something I am glad I did not miss. If you are familiar with the tune of “Lacrymosa,” it has been playing in my head non. stop. If not, I encourage you to look it up. It’s beautiful and the piano guys do a cello cover of it mixed with Adele’s “Hello.” Wundebar! I am now sitting in Linz in a hotel room alone blogging. It is so nice to be around people and have fun, but it is so nice to look back and reflect on my time spent here in just the past two days. I’ve been itching for a time to get away, truthfully, to pursue what may lie in my thoughts that I have yet to stop and discover. The mind is so interesting to me. If we don’t stop every once in a while we may miss something, or forget something. It is my mission to retrace everything chronologically on this trip, so as to never forget anything. Though it not be possible to catch even single detail of my days abroad, I will still chase that hope. This trip has been talked about since first semester of junior year, and I cannot believe the sights around me. I’m reminded of something a friend of mine said of herself, “I’m the kind of person who can be entertained by the way a leaf looks in the sunlight.” She has always reminded me to appreciate the small details, the little things in life that God has made beautiful. So, today in Salzburg, Austria I did just that. I’ve always been one to appreciate aesthetic beauty, so the mountains served my vision well. Standing in front of views of the city, in between giant hills and breath-taking mountainous landscapes that looked as if they had been painted—like they weren’t actually in front of me, but maybe still on my Pinterest board—made me so….small. There is so much beauty in looking at what is in front of me, how big everything is in front of me, and knowing that I serve a God who is so much greater than I can even see. My camera couldn’t possibly capture every moment, nor do any of the views justice, but here is a link to my album, and a few more pictures of the little things. Isn’t it truly is a blessing to see God everywhere we turn? You don’t have to be in Austria, or Germany, to appreciate Him. He is sovereign, and by His grace we are here. I’ll speak more on that later, but for now enjoy what little I did to try and capture the beauty that is Salzburg, Austria. As you can see by the title, we have FINALLY arrived in what could only be counted as a dream of mine, an impossibility among a plethora of impossibilities accomplished throughout its empire. I’M IN ROMA! 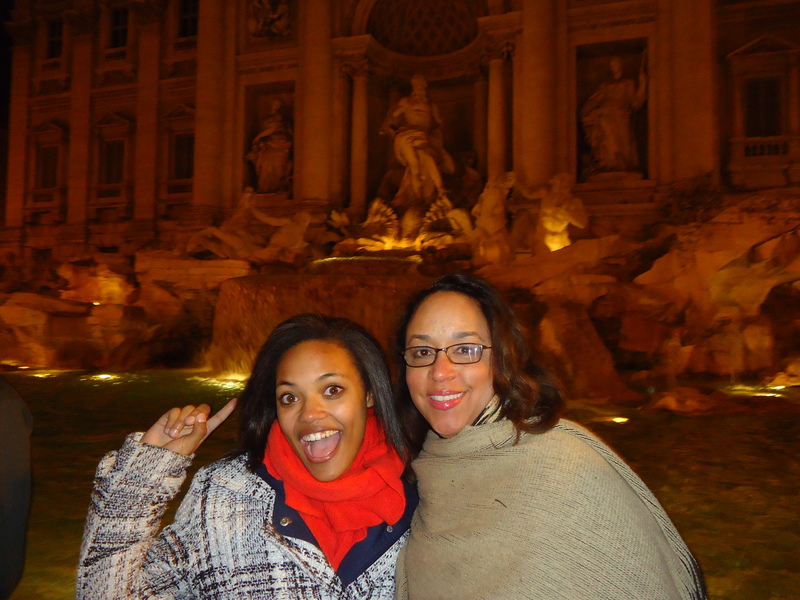 And when in Rome, you might take a tour called “Rome By Night” led by your awesome tour guide, Stefania! (We had an awesome bus driver, too–Tonino, to whom we said every morning, “Bonjourno, Tonino! 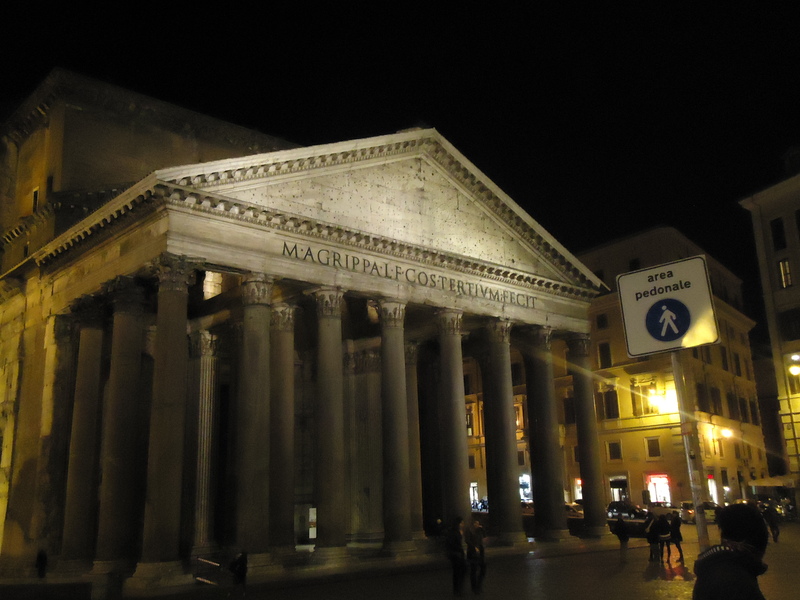 !”) I’m not going to even lie…I did tear up when we drove past the Colosseum at night. The sight of it was breathtaking. To think about what went on in that stadium and how many people died there. Alas, there was no Russell Crowe winning battles for us, and there was certainly not enough time to explore it. Oh, and it was magical!!! I cried, again!!! Everywhere I went I had to touch everything. I touched the buildings and the streets and sometimes cars (hehe). 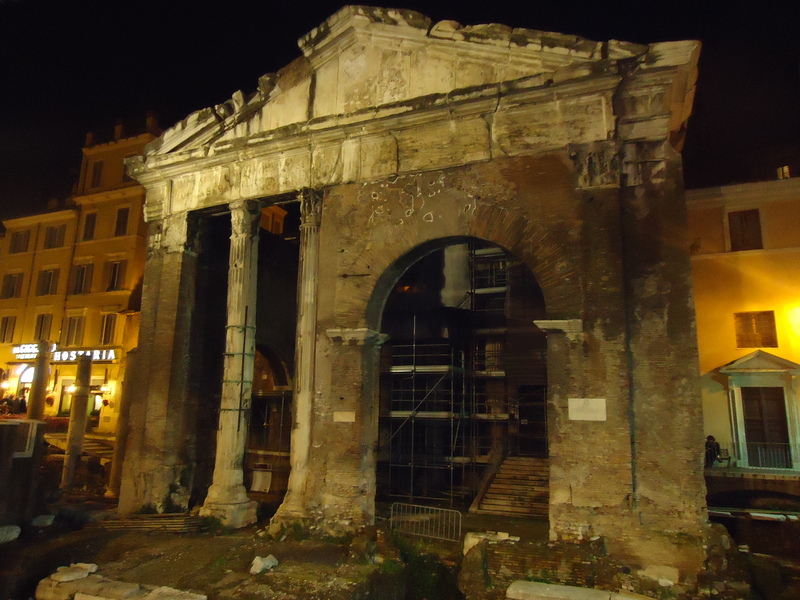 Rome by night was one of my favorite experiences because we went when no people were going to be around and it was peaceful and beautiful and I just love HISTORY. Aw, man, I cannot wait to keep going!!! Tomorrow can only be a million times better! !